Today, the need to recycle right is greater than ever. The supply of recyclable materials is growing even as demand for reclaimed materials shrinks. As much as 30% of recycling was once sent to China. That has been reduced to 3 to 5 percent of its former volume. Simple, inexpensive strategies can reduce hauling costs, make better use of materials, and to limit landfill accumulation. Successful recycling (with minimal contamination) begins with two or more bins, placed strategically. In many office environments, two is the ideal number. For consistent long-term results, recycling should be easy and convenient, with no unnecessary complications. That means one bin for recycling and a second bin for trash. Office recycling containers can run from low cost to high three-digits but regardless, should be blue. Blue is the recognized color for bins you see everywhere so people know that is where the plastic bottles, soda cans, cardboard, and clean scrap paper can go. A second bin, which ideally is similar in appearance, should be a black or gray trash bin. Not sure if an item is recyclable? Put it into the trash! When recycling becomes contaminated with trash an entire load may be destined for a landfill. The easiest way to avoid this is clear, simple signage. To prepare a recyclables sign, take a moment to consider what items might be best placed in that blue bin. Choose the top five or so. If the bins will be placed in a break room, plastic bottles are a likely candidate. In a warehouse or stock room, cardboard will be among the five. Consider what your organization purchases most often. Some of that may and should be, “top five” items. The header of a recyclables sign should be the same color as the bin, especially if you have strayed from blue. Below that header, put photos and possibly a one-word description of the top recyclable items. A quick online search will yield the photos. The “trash” sign should match the bin color. Graphics are not required unless you want to emphasize that marterials are going to the landfill. Sometimes, materials which could otherwise be recycled become contaminated. That makes them trash. A plastic plate, even when imprinted with a triangle logo, should not be recycled with food waste on it. Cardboard boxes with pizza grease or other contaminants belong in the garbage. If not composted, food waste is garbage. If it remains on the surface of a glass jar or yogurt cup, that item is nonrecyclable as well. Plastic bags don’t belong in your office or home recycling. Don’t place recyclables in a bag or it becomes trash. Soft plastics (bags, wrap) accumulate around the gears of the sorting machine. This can shut down the MRF for hours at a time and cost the MRF valuable revenue. Return plastic bags to retailers such as grocery stores, Wal-Mart, and Target. If it is sharp and can cut someone or is pressurized can explode under compression, please do not recycle it. Chemicals and petroleum products require disposal at other specialized facilities, not a general recycling plant. Clothing, water hoses, cords, and other stringy items can tangle in the industrial sorting and processing equipment. MRF employees can be injured and equipment can be damaged when tangling items are tossed into recycling. Does your organization need more information about which materials are contaminants? Make sure you check with your local recycler to find out what materials are acceptable in recycling. Plastic, glass, and metal containers should be rinsed before recycling. Are plastic bottles a “top five” recyclable? Consider using a photo of a crushed bottle on your recycling signs. With just a twist, caps can be removed before the bottle is crushed, then replaced before tossing it into the blue bin. That keeps loose bottle caps from falling through sorting equipment. 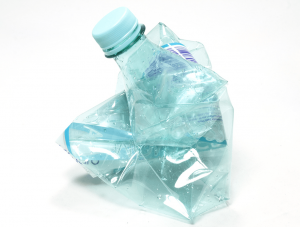 Also, the crushed bottles take less space and will not make a projectile of the cap during processing. Recycling should not be bagged. The MRF will discard bagged items as trash. Depending on what is purchased at your business, your organization may find savings or other cost benefits from reusing or recycling specific types of items. Many grocery and retail stores install cardboard bailers and then recycle by the pallet. Your shipping/receiving room may not require that capital equipment but might benefit from setting flattened boxes aside for occasional recycling. Do you purchase printer and copy paper by the carton? Many offices place those empty cartons strategically near shared printers and copiers and have a paper recycling program. Staff uniforms, towels, and other textiles, especially in the hospitality industry. The American Textile Recycling Service (ATRS)  provides bins and accepts tax-deductible charitable donations in many southern cities. 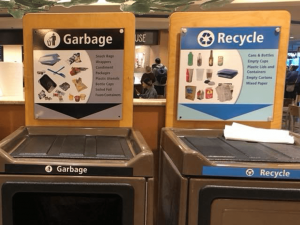 Once an organization has decided what to recycle, where to place the bins, and how to label them, the recycling program requires minimal maintenance. Support and feedback will encourage participation, but training is seldom required. Occasional mentions in quarterly meetings can remind a team that recycling remains a priority. Sometimes, a quick check of program progress can measurably reduce waste management costs. At ecoPreserve, we would be pleased to share waste audit information with you as well.